The first workout time is slow. I need to warm up more before starting a WOD. I dont like warming up but it is starting to become mandatory if I want a great workout. Im not talking squat 10 times some pull ups and push ups. I have to do a short met con for 10 or 15 minutes to get my blood moving. Maybe this will change when it warms up in Austin. All the folks who did the Workout. 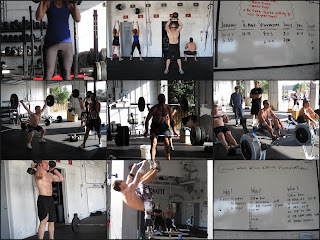 Andy Lewis had the best over all time after all three WODS!